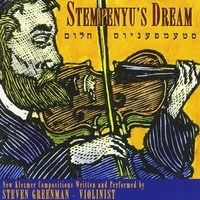 The first studio recording comprised entirely of originally composed traditional klezmer violin music, Stempenyu's Dream is the music of violinist, Steven Greenman, one of the finest practitioners of East European Jewish violin music in the world today. "With this recording, Steven Greenman is revealed as the foremost composer of music in a style based on what we know of these Jewish violin traditions of 100 years ago." "...the music Greenman has composed is of such striking beauty..."
"...Greenman's violin demonstrates that he could teach Vassar Clements a thing or two about country klezmer." "Diving deep into the past, Greenman has created a contemporary Jewish music of spellbinding beauty. It should only start a trend." Known for his soulful renditions of East European Jewish music (klezmer) and passionate performances of East European Gypsy music all combined with virtuosic flair and technical precision Steven is a multi-talented musician well-versed in a multitude of musical styles and genres. Whether performing klezmer music in European concert halls, giving master classes of East European Jewish violin style and technique, performing lavish Gypsy violin showpieces with orchestras and ensembles or playing for Jewish, Hungarian, Slovak, Romanian balls and weddings Steven is at home displaying his love of East European Jewish and Gypsy music. Recognized internationally as one of the finest practitioners of traditional East European Jewish klezmer violin, Steven is also one of the foremost composers of traditional klezmer violin music. His current project Stempenyu's Dream involves a CD recording of his original Jewish and klezmer violin compositions, a series of concerts of the music and a future publication of the material. One of the first American born klezmer violinists to create a program and performance style based entirely on the repertoire of European klezmer violin music, Steven co-founded the Khevrisa ensemble together with the cimbalist, Walter Zev Feldman in 1998. Steven has performed internationally with Khevrisa and other notable klezmer ensembles such as the Klezmatics, Budowitz, the Flying Bulgar Klezmer Band, Kapelye and Di Tsvey (the Greenman/ Rushefsky duo). His own ensemble, the Steven Greenman Klezmer Ensemble is dedicated to performing his own compositions and the transitional Jewish/Moldavian klezmer repertoire. As a teacher of klezmer music Steven received a grant to be the first recipient of the Louis E. Emsheimer Memorial Artist in Residence Program in Cleveland, Ohio (2002) for which he led klezmer workshops for classical string players and lectured on klezmer music. He has taught klezmer violin and led string ensembles at the KlezKanada festival, Living Traditions' KlezKamp and KlezFest London. Working with educators Mitchell Korn and Amy McClellan of the Cleveland Orchestra educational department's "Learning Through Music" program Steven was selected as a "Teaching Artist" and developed a children's program combining story telling and klezmer music. Steven has collaborated with New York dancer/choreographer David Dorfman and the Cleveland State Dance ensemble as musical director in Dorfman's "Moving Histories", a modern dance piece dealing with Jewish identity, and performed with members of the Klezmatics in the 1997 performance of Tony Kushner's adaptation of S. Ansky's "Dybbuk." Steven has lectured and performed at the Jewish Culture Festival in Krakow, Poland and has been a regular performer with various ensembles at Toronto's Ashkenaz-A Festival of New Yiddish Culture. In addition to his involvement with klezmer music Steven is an accomplished performer of urban Gypsy violin styles, in particular, Hungarian nota, Romanian lautari music and Slovak folk music. Steven has devoted his life to the study of these styles learning East European violin style and ornamentation from professional Gypsy and folk musicians from Slovakia, Romania, the Ukraine and Hungary in addition to transcribing and arranging hundreds of tunes. As a concert performer, Steven has been a regular guest soloist with the Cleveland Pops Orchestra performing his own arrangements of traditional East European Gyspy violin music. Steven will be featured on a forthcoming CD of urban Romanian Gypsy violin music together with the cimbalist, Alexander Fedoriouk and has performed often with the ensemble Harmonia. As a classical violinist Steven received both his Bachelor of Music and Master of Music degrees in Violin Performance from the Cleveland Institute of Music studying with Linda Sharon Cerone, Dr. Eugene Gratovich and the late Bernhard Goldschmidt. Steven has also performed as a member of the Canton and Akron Symphony Orchestras and has participated in the National Repertory Orchestra, the National Orchestral Institute and the American Institute of Musical Studies in Graz, Austria. Steven is lead performer, composer and producer of the recording "Stempenyu's Dream." Together with Walter Zev Feldman, Steven co-produced and is featured on the recording "Khevrisa-European Klezmer Music" on the Smithsonian Folkways label. Steven has also recorded with Budowitz, guitarist Jesse Cook, vocalist Lori-Cahan Simon, Alicia Svigals and the Flying Bulgar Klezmer Band.